Here's a great book that I stumbled upon a few years back and use quite often. I generally don't give away stuff that isn't mine to give, but Dave Tough is no longer with us and this book has been out of print for quite some time. So I figure the only people getting ripped off by not sharing it are other drummers. If you know your jazz history and remember the Austin High Gang, who are credited with playing a big role in the formulation of the the Chicago style of jazz, Dave Tough was one of them. His bio over at Drummerworld describes him as "a subtle and versatile drummer who hated to solo". Truly my spirit animal. 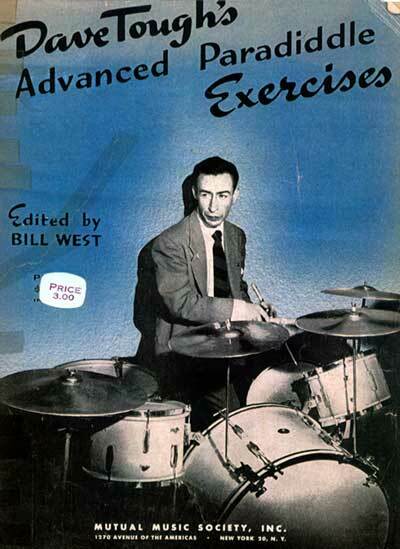 "I have designed this book for the advanced student who has a knowledge of the rudiments of drumming. The book deals with the three forms of paradiddles - single, double and triple, each form represented and mixed in each of the two hundred exercises.This will assure him of improved coordination, technical development and fluency of sticking in his practical day to day playing. It will be invaluable to the individual, while practising these exercises, to play two or four foot beats to the bar.To my knowledge, this is the only book published that is devoted entirely to varied paradiddle exercises.In conclusion, I have found that too little time is devoted to the practising of varied combinations of paradiddles, and it is my sincere hope that this book will prove to be an aid in acquiring a well-rounded system of drumming." You can download the book here. That link redirects to Mark Feldman's Bang The Drum School blog. If that link is no longer working by the time you discover this post just drop me an e-mail and I'll happily send you a copy.